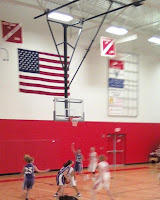 The Ordinary Life of an Extraordinary Girl: Basketball season has officially started - take two! Basketball season has officially started - take two! After a few phone calls to the coach and an intervention from Alex’s teacher we have a new strategy about the basketball team. Alex will be floating between the JV and the C team. We have a new coach this year – and this was her suggestion. I trust her judgment, for now. Last year Alex played on the JV, she was one of two freshmen on the team; it was a huge honor for her. Last year’s coach believed the JV team was “safer” for Alex. The girls had better ball handling skills than the C team, who are traditionally freshman. The girls were mature enough to work with Alex and support and include her on the court. I believe this is a win-win for all parties involved, and heard as much from the other parents last year. Alex played in every game – at least a few minutes each quarter and scored about ten points overall. There were social events and sleepovers in motels for the away games, since away in rural Colorado can be about four hours. She developed a good set of friends, and earned the nickname “Big Al”. I had assumed this would be the case this year. The Coach this year feels that the skill level on the C team is similar to Alex’s skill level. She has changed the make-up of the team to include more sophomores, so Alex will not be the only freshman. We are assured that Alex will get more playing time and she was already interacting with her team positively. I admit this makes sense to me. I will miss the camaraderie that Alex developed with the JV and V girls; most are playing this year, there were only two seniors who graduated. But his should also be able to happen on the C team. Right? Last night was the first C team game; it was a local away game. The games started at 4:00 so I was not able to make it – and this account is from John. When he arrived, after his 45 minute drive, the game had started. Alex was sitting on the bench; she is number 42 this year. He recognized some of the girls on the team; they are freshmen and had been in Tom’s class last year. These girls are good athletes, and have always been nice to Alex; she had played with them in the Middle School. This is good! I asked John to text, call and take pictures for me. The first message I got was towards the end of the first half and was a picture of Alex making an assist. When I called for an update about a half hour later I was told this was the only time Alex was in the game - one minute in the first half. I guess you can understand my confusion – wasn’t Alex on the C team so she could play more? As always, I cautioned myself not to jump to conclusions, and to wait until Alex got home to form my opinions. Alex walked in the door beaming. She recounted the entire game to me including her assist. The team lost by two points, but was a good game. I asked her how much she played – and she told me “a little, but I am playing in the JV game today”. This math does not really make sense to me – one minute in the C team game and then participating on the JV team. I feel something is amiss. So, for now, I am on the “wait and see” stage of basketball season. This is a bit tricky for me, I need to be sure that Alex’s safety and happiness comes before my own expectations. I am good at gauging her happiness. I can tell by the way she gets out of bed or the smile on her face if she is looking forward to school. This is my barometer, but I have to monitor it with self advocacy. Alex needs to talk to the Coach if she is not happy, or not included. I can help, but she needs to participate. This is the tough part, but self-advocacy is a key to her future success. There are two away tournaments this weekend, and I will measure Alex’s happiness and manage it with my definition of fair play, team work and Alex’s happiness. Lots of work – but the result is so positive and rewarding it is worth every second!